A quick search about Kottayam waterfalls may reveal a few things. None of them are really big. And unlike in the case of neighbouring Idukki, they do not add up to a big list. Still there are a few good ones. If you want a waterfall picnic or a jungle trek with a cascade touch, Kottayam has its share. Do you have plans for Kumarakom holidays? Kumarakom backwaters are well known, not so known is the waterfall hiding behind the canopy of rubber trees. Take a 2 kms trek from the village shops through the mud lane that lead to the plantations. There is plenty of shade as rubber trees are all over. There are a few streams in between as well. Aruvikkuzhi is a small waterfall. That is generally overlooked because of the excellent scenery and the uplifting feel. The best time to visit is from September. During peak summer (April –May) the waterfall dries up. Kumarakom, 18 kms from Kottayam town has vast backwaters with plenty of house boats, an island (Pathiramanal), and a bird sanctuary. If you are serious about waterfalls, loves a bit of adventure and looking for refreshing treks, Maramala is a perfect fit. The final leg of the journey to the waterfall is along a rocky path through the rubber plantations. A jeep or four wheel drive can tackle about two kms. The rest of the travel has to be on legs. And mind you, that is 5 kms one way. Maramala fall is about 60 m high. The forward flow after the fall is Teekoy River. Erattupetta is a regional town, about 50 kms from Kottayam. Teekoy rubber estate, where the final leg of the journey starts, is a couple of kms from Erattupetta. A trek to Ayyampara hill station is well regarded for its scenic delights. The starting point is Teekoy village, from there to Cherippad followed by Ayyampara. It is a waterfall with many names - Valanjamkanam, Murinjapuzha and Ninnumullippara falls. 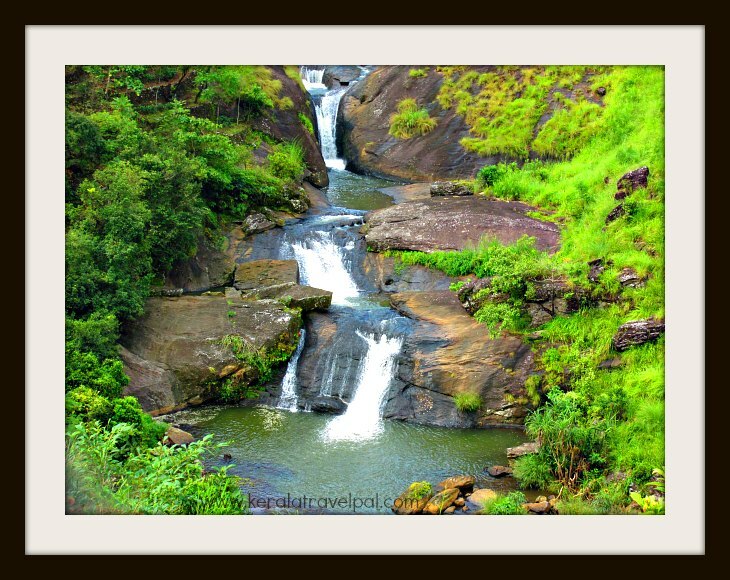 It is a road side cascade on Kottayam – Kumaly highway. Water makes its way down touching several rocky steps. The height is about 23 m.
The location just near the road is both a plus and a minus. It is easy to stop by and take a few snaps quickly. For picnics, better look elsewhere. While adventure holidaying at Kuttikkanam, Kesari falls is a short ride away (4 kms). Kottayam is 68 kms west of Kesari falls. Aruvikachal, a little over 70 m high, is one of the tallest waterfalls in southern Kerala. It is at Poonjar Thekkekara, about 67 kms east of Kottayam town. The best time to visit is September onwards. Water dries up by late March - April. The waterfall is inside the woods. Patampuzha Junction on Mundakayam Road is the last point where vehicles can reach. Further trek is about 2 kms. If you are travelling this far, why not include Poonjar palce in your tour? Poonjar is only 7 kms away. The palace, converted to a museum, is one of the tourism highlights of Kottayam. There are a few small waterfalls usually not included in travel brochures. One of them is Vadakkemala waterfall near Koottikkal, about 5 kms from Mundakayam town. Kazhukankulimali is an 80 ft fall at Kannadippara, the highest peak of Elaveezha Poonchira hill station. Vellamneekipara waterfall is the local delight of Ramapuram, a country side about 37 kms north east of Kottayam.